Beacon Press: Is Inequality Bad For Our Health? In this election year, health care again proves to be one of our nation’s most urgent issues. 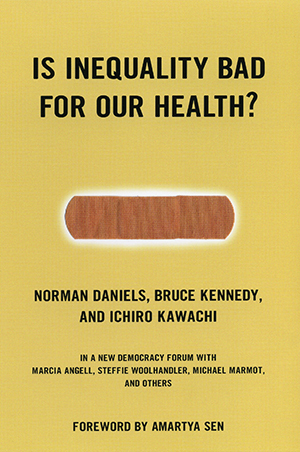 Daniels, Kennedy, and Kawachi shift the focus of the debate, forcing us to take a closer look at how our health is affected by social injustice and inequality. Arguing that it isn’t enough to increase access to doctors, they call for improving social conditions-such as poverty, lack of education and affordable housing, and harmful work environments-that damage our health. By urging us to work toward equality of opportunity for all, the authors situate health care reform among the larger social problems we must face. The authors’ argument for reform in early childhood development, nutrition, work environment, and distribution of income is certain to spark debate. The editor of The New England Journal of Medicine and World Health Organization officials respond.